"arguably as interesting a three-year-old prospect as Saxon Warrior…while his connections are fancying a crack at the Guineas, there’s a good chance he’ll stay at least a mile and a quarter"
"he has several fillies with classic potential in his yard…a darker Oaks possible in our fifty…was most impressive when beating a subsequent listed winner in a maiden at Doncaster"
Timeform Top 100s and 'Promising Horses' lists (over 500) – many more to follow! Price £10.95. Jumps edition out every October; Flat edition out every March. Published in softback and available direct from Timeform, including checkout by PayPal, and from Amazon*. Click on a button, link or scroll down to our product boxes to order your copy. 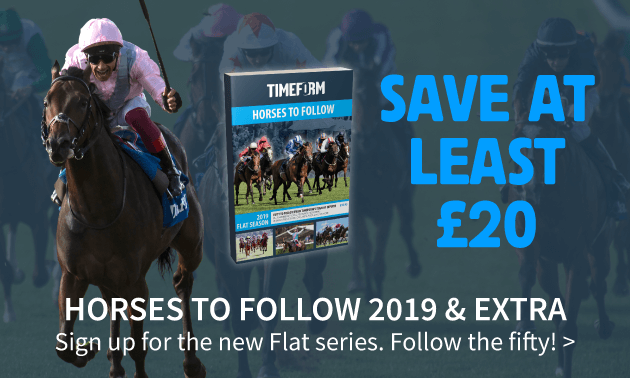 SAVE WHEN YOU ADD HORSES TO FOLLOW EXTRA! Get the best insight and analysis for the big meetings and festivals with Horses To Follow Extra. There are ten issues throughout both the Flat and Jumps seasons which are the perfect complement to the book. Stay in touch with a host of eyecatchers added in each edition. All 10 issues of HTFX for 2019 season, published online starting May 1.